DALLAS — New U.S. consumer data from Parks Associates finds the average NPS (net promoter score) for traditional pay-TV providers in 3Q 2018 is -19. 360 Deep Dive: Churn and Retention in Pay TV notes this NPS represent a slight drop for pay-TV providers, which scored -15 in 1Q 2018, although some providers such as Optimum and DISH improved their individual scores. By comparison, the average NPS for the major online pay-TV and OTT video services is positive, although their overall scores declined from 2017 to 2018. Net promoter score measures willingness to recommend a service and is widely used to assess consumer perception of services and providers. 360 Deep Dive: Churn and Retention in Pay TV examines the current state of churn among pay-TV providers, with a specific look at cord cutting, cord nevers, the impact of new OTT video services and skinny bundles, triggers to churn, and effective retention tools. 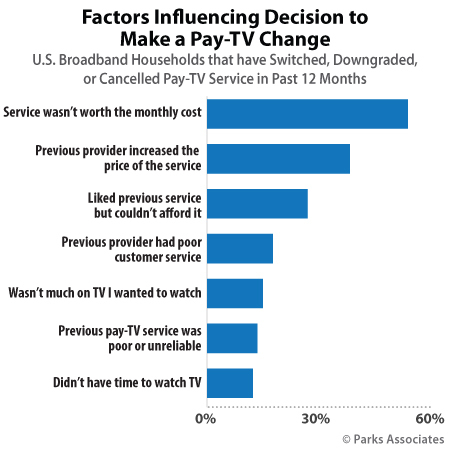 79% of U.S. broadband households reported having traditional pay-TV subscriptions in early 2018. Approximately one third of pay-TV subscribers made a change to their service between 1Q 2017 and 1Q 2018.